A luxurious cut of Lamb that’s ideal for a quiet dinner for 2 or an elegant dinner party for many. And so many side dishes to accompany it are compatible. Creamy mashed potatoes, or mashed Parsnips. Classic French Flageolets. Most any Green like Creamed Spinach. Matter of fact, there are very few vegetables that wouldn’t work. This rack was coated with Pomegranate Molasses that added a wonderful flavor to the crust. Highly recommended. 2. 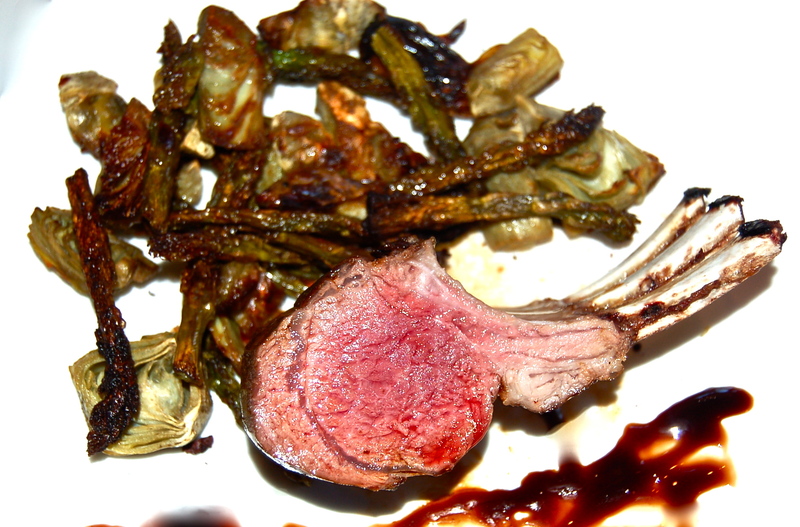 Brush the Lamb with the Pomegranate Molasses & season with Salt & Pepper. 3. Place in a cast iron skillet, meaty side up. Roast for 15 minutes or until an internal thermometer registers 120 to 123 degrees for rare. Of course you can roast it a bit longer, to your taste, but definitely not to well done. 4. Remove from the oven. For the meaty side to have a richer color, turn the meat onto that side in the pan & cook for a few minutes. Allow to rest for at least 5 minutes before plating. 1. Allow the Artichokes to thoroughly defrost. 2. Combine them in a large bowl, add the EVOO & generously season them. 3. Place them on a baking sheet or a casserole dish in a single layer. Into the oven for about 35 minutes. Don’t allow them to burn, but you do want a bit of Caramelization.